On Saturday and Sunday, September 19 and 20, the third annual Vancouver Modern Home Tour and first-ever White Rock Modern Home Tour will take place in one weekend. Both are featured events in Western Living Magazine’s Design Week, and will give residents of British Columbia the rare opportunity to visit and walk-through some of the most amazing modern private residences, and meet the local architects behind the designs. Modern Home Tours LLC is returning to British Columbia for a full weekend of modern home and architecture exploration. During the 3rd Annual Vancouver Modern Home Tour on Saturday, September 19th, attendees will have the opportunity to explore seven modern homes in the Vancouver area that exemplify modern architecture and living. The following day, Sunday, September 20th, five homes in the small coastal towns of White Rock and Surrey will open their doors for the first-ever White Rock Modern Home Tour. 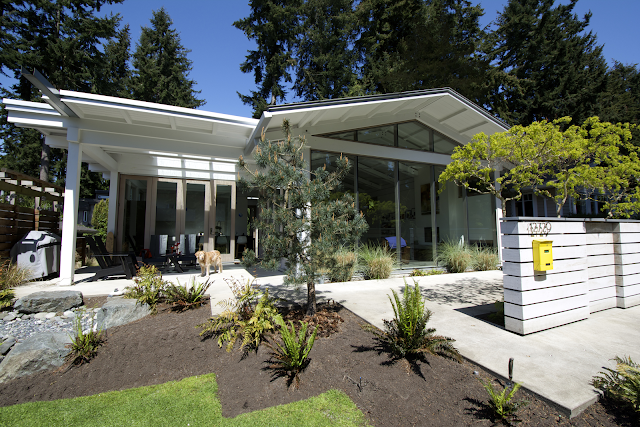 Participating homes in the 2015 Modern Home Tour will open their doors for viewing from 11AM – 5PM on Saturday and Sunday, September 19 and 20, in and around Vancouver (19th) and White Rock (20th). Tickets for the tour are $30 in advance online or $45 on the day of the tour - a combo ticket is also available for purchase. Kids under 12 are FREE when accompanying their parents. In the heart of downtown Vancouver’s West End, visit a 1,000 sq. 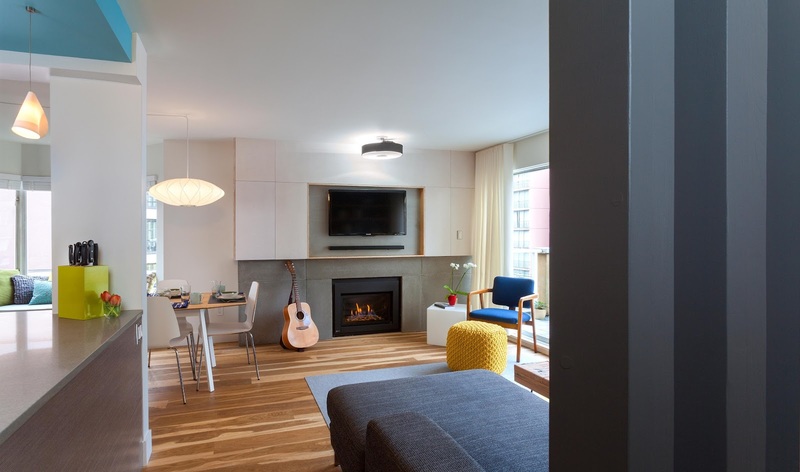 ft. condo, recently gutted and brought back to life by One SEED Architecture + Interiors. Influenced by the character and materials of a converted New York City loft, the floor plan was renovated to create an open concept design, where spaces are defined by colour, lighting, and design accents, in lieu of walls and doors. Lanefab Design/Build is showcasing their “Two Birds” Lane House, located in the Kerrisdale neighbourhood. The laneway house is unique in that the relatively large lot allowed the small home to be designed with two separate wings: a living/dining space with a guest bedroom, and a separate master suite separated by a small pocket garden. The project uses super insulated walls and triple glazed windows, and features reclaimed beams for the structure. LCI Design invite visitors to see a major renovation and update to a 1960′s Lewis Post and Beam house located in West Vancouver. The owners were compelled to maintain as much of the original mid-century charm of the house as possible, but at the same time give it a contemporary update. A major component of the renovation was the transformation of the existing dirt-floor basement into an additional living area for a young family, which can be converted into a rental suite in the future. Located in the “Little Australia” neighbourhood of the UBC endowment lands in Vancouver, this home designed designed by Frits de Vries and built by Natural Balance Home Builders is a response to its build site: the roof alludes to the stunning mountain view, while the plan addresses the view of downtown Vancouver and then fans out to address the street at the front entry porch. The home internalizes the geological forces of the primeval place, revealing the strength underlying the structure of Vancouver. In North Vancouver, visit the “Cliffhanger Residence” designed by Kevin Vallely that is situated on the steep south facing slopes of North Vancouver’s Indian Arm. This boldly modern three-level home with a surprisingly tiny footprint sits atop a tiny site - a mere 25ft wide by 100ft long that drops nearly 60ft over its 100ft length. As a result, the home is laid out on a simple open plan and is designed to be efficient and multi-functional with no space going unused. Located around the corner from the Cliffhanger House is a home built by Wheeler Developments and designed by Schema Designs. This brand new home exemplifies West Coast Modernity while perfectly reflecting its natural environment, by using green building practices and finishing materials sourced from its immediate surroundings. Interior features include vaulted ceilings, an open main floor plan with a floating fir and metal staircase, and a custom fir millwork kitchen. The exterior features include a massive granite chimney and a detached 3-car garage. 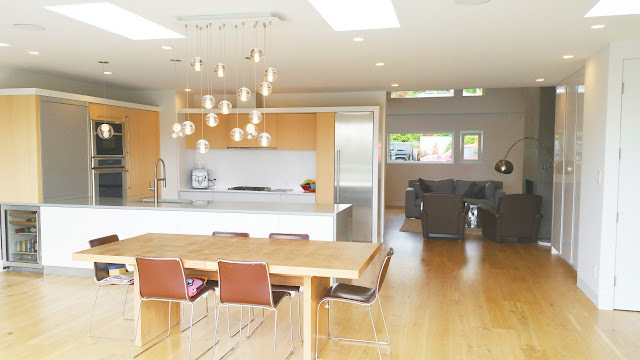 Finally, visit a renovation project, designed by Wexler Architecture, that added 1,000sf to an existing bungalow-style home in North Vancvouer and replaced the existing roof structure with a heavy timber vaulted glulam roof assembly. The exterior siding, windows and main floor walls were all completely replaced to allow for a spacious, open plan living space, modern master and 2 additional bedrooms. The home now features energy star windows, rain screen construction and large opening nana walls and windows for cross ventilation and indoor outdoor living. Overlooking Semiahmoo Bay in White Rock, “Galadriel” is a refined, modern home with the warmth and strength inherently found in West Coast architecture. Textures of natural stone, Douglas fir, glass and steel unify the interior with its geographical setting – surrounded by evergreens and unrestricted views of the ocean. This home reflects a successful collaboration between Peter Hildebrand and Stefan Walsh of Iredale Group Architecture and KBC Developments. In an idyllic beach community in Surrey, visit a modern family home filled with both playful and functional spaces. “Vidro Do Mar” is a result of a collaborative effort between KBC Developments, Concept to Design Inc., and the client. Natural light reflects throughout and oversized openings allow for movement to the outdoor spaces, while custom millwork completes the kitchen with concealed appliances, and creates a space well suited for entertaining. A second KBC Developments and Concept to Design collaboration, located in White Rock, is well-known to architecture fans and residents in the area as the “Wave House.” Situated on a challenging sloped lot, an elegant and modern home was achieved with expansive and serene views of the ocean, and spaces outdoors that incorporate water and fire elements. Inside, each floor, named Sand, Sea, Surf and Sky, is connected by a floating walnut staircase and an elevator concealed by walnut paneling in the entrance. Visit a mid-century inspired home in a neighbourhood by Kwomais Point in Surrey, designed by Brad Martin of Treeline Construction Limited. Built in 2013, the owners wanted a home that reflected their casual lifestyle. The result: floor to ceiling glass and a retracting wall of doors integrates indoor-outdoor living; post and beam ceilings and oversized doorways create a spacious feel, while concrete floors and sturdy hand built furniture perfectly suit the family’s casual life style. Also in White Rock, visit the “OShaun” house (pronounced ‘ocean’), a name derived from a combination of the owner’s names. Designed by Owen and Shauna Poppy of Surfside Construction, the home features amazing views of the bay and is filled with plenty of natural light. The home is a cumulative combination of ideas and materials born from 5 decades of living on and around Semiahmoo Bay and the joy of living a wonderful life together. Photo from White Rock Modern Home Tour by Treeline Construction Ltd. The giveaway will end on September 17th, 2014 11:59pm and the winner will be notified the following day. Good luck!